The screw in my glasses fell out! What screw will fit? The arm on my glasses fell off completely. The tiny screw has fallen out. I am not sure if the glasses have a spring hinge or not, but the holes do not line up very well. I can put a tiny wire through the hole to reattach the arm of my glasses. When I use this small piece of wire, it makes my glasses loose so they are not properly aligned on my face. 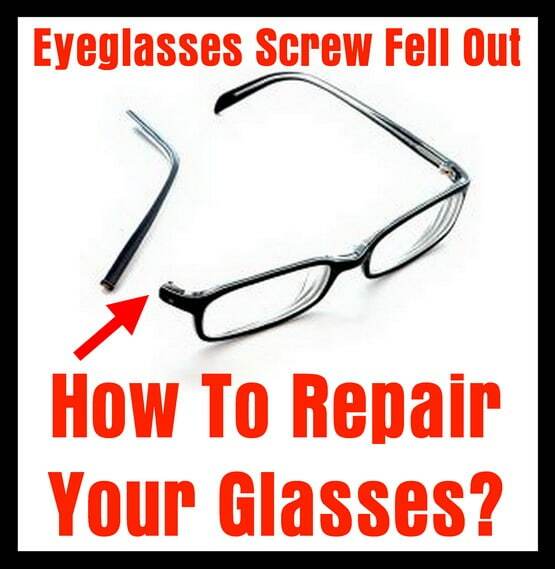 Is there somewhere I can go to get a screw that will fit in my eyeglasses that will fit? I have a pair of sunglasses that are the same way. Please help. If you need help with finding the exact dimensions of your eyeglasses for further repairs or replacement parts, see our page here concerning How to find the dimensions of your eyeglasses. The easiest way to fix your glasses is to get a universal eyeglass repair kit. 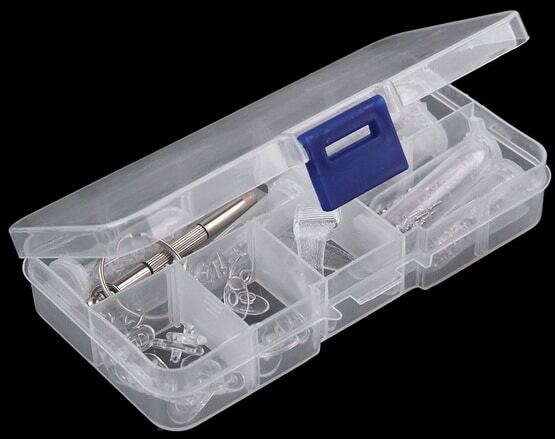 The kit contains the screws and the tiny screwdrivers you need to repair your glasses, eyeglasses, or sunglasses. The kit will have many different types of screws by length and color. These kits can be used on the hinge or nose piece of your glasses or sunglasses. 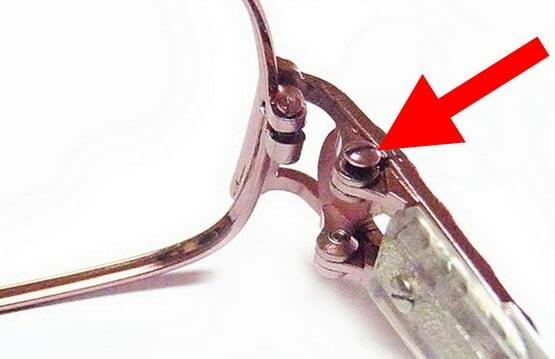 You can find an eyeglasses repair kit at any dollar store, Wal-Mart, Target, etc. The repair kit will be located near the checkout counters or where they sell the reading glasses. If you do not have access to purchasing the eyeglass repair kit at the store, you can get a highly rated repair kit online. 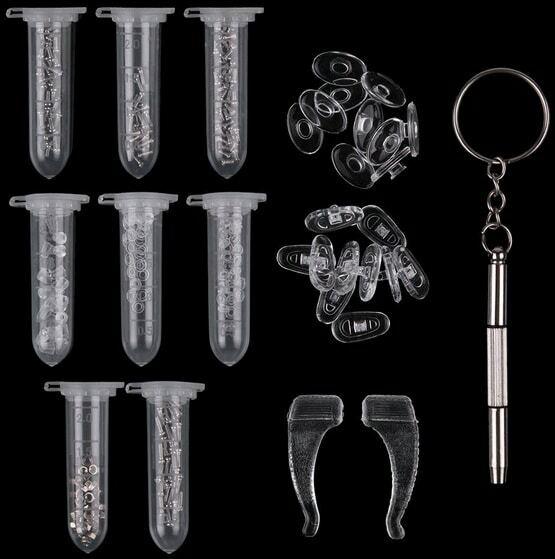 It is called the Sanheshun Eyeglass Sun Glasses Optical Repair Tool Assortment Kit Screw Nut Nose Pad Set. It is currently $8.88 US dollars and has one day free shipping. With all of these different screws, ear pads, nose pads, and the correct screwdriver, (Phillips and flat head), you will be able to repair your eyeglasses or sunglasses without going to an expensive eye glasses store. Keep the kit on hand for future repairs. Below you will find a parts diagram for both eyeglasses and sunglasses in case you need to identify the broken or missing part on your glasses. There are many different issues that can arise with your glasses breaking, having missing pieces, or needing small parts replaced. Check the video below for how to repair your eyeglasses the fast easy way or the professional way. Do you have questions concerning your broken, loose, or missing pieces on your eyeglasses or your sunglasses? Please leave a comment below and we can assist you with directing you to find the right parts needed or how to fix them in the easiest way possible. Next post: My Airline Boarding Pass Does Not Have TSA Precheck On It – How Do I Get It?